· Sample: My #YouthSpark was [coding classes in the summer]! Now I'm a [company founder or developer] with #[your company]! To bring this into focus, this week, I have an exclusive interview with Molly Burke. When she was just four years old, Molly Burke's world began to darken: she was diagnosed with retinitis pigmentosa, a retinal disease causing loss of vision. But despite this and the ensuing obstacles and hardships she faced, it wasn't long before she began bringing light into the lives of others. Molly began public speaking at the age of five. Since then, she has inspired thousands with her story. Over the years, as Molly's vision deteriorated, her confidence and optimism only strengthened; but not without trying times or adversity along the way. 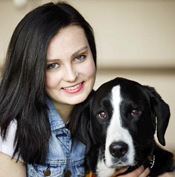 As a student, Molly was tormented by bullies who mocked her for being blind. She became depressed and struggled with mental illness until she found the strength to face her challenges, the courage to reach out to others, and most importantly, hope. As a motivational speaker with Me to We, Molly has travelled across Canada and the US sharing her story with youth, families and corporate organizations including RBC, KPMG, Coca Cola, PotashCorp and Green Giant. She has also travelled to Free The Children communities in India and Kenya. Molly has shared the We Day stage with Larry King, Demi Lovato, Macklemore, Archbishop Desmond Tutu, Jennifer Hudson, Chris Hadfield, Magic Johnson, Martin Luther King III, Martin Sheen and Mia Farrow. She was also a correspondent on the Orange Carpet for the 2013 Halo Awards. She believes that we gain strength from sharing our stories and that we can learn from the struggles of others. That's why she lives by the motto....live, learn and pass it on. Molly, you have so many outstanding contributions and have inspired millions. Thank you for sharing your considerable journey, deep accumulated insights, and wisdom with our audience. "....Thank you very much for letting me be a part of this...."
Can you talk about some themes from your keynote? "....There are so many things that I think people can take away from my speech. Something different resonates with each person, but I think the overarching theme throughout is the message of hope, to find that hope inside of you and keep it alive...."
: Do you have some key messages that you want to share with the audience in general? ".....Just that they should not be ashamed of who they are. I think everybody should be proud of where they've come in life and the challenges that they've faced...."
Do you have any stories from your personal life that you want to share that speaks to that message? "....I was diagnosed at 4 years old with a rare genetic disease which basically (fast forward 10 years), led to me going completely blind at age 14. It's one of the worst times I think it could have happened. My classmates didn't really get what I was going through. I was different, I was changing and they didn't understand it so they took it out on me and I was ridiculed and bullied severely and at that point, I did lose my hope. I lost the hope that I would be okay, that I would get better and that I would survive and it led me down a very dark path.....I think my journey of finding hope and the support that I found along the way is really what's got me here to this successful point in my life at just 21...."
Based on the themes in your keynote, based on the experiences in your life, how can young people take action from some of these messages? "....The thing is, what people need to realize is you have the power to change the world no matter what age you are. I started public speaking and fundraising when I was just 5 years old and everybody has the ability to do that. We all have the strength within us to stand up for what we believe in...."
In your opinion, how can governments at all levels get involved in supporting youth? "....We need people higher up like them to step in and to start trying to raise awareness and to make a difference...."
Why should executives care and how can they contribute? "....It's about choosing to find the cause that you care about - find a passion and do something about it. Whether that's fundraising or raising awareness, it doesn't have to be something huge, it could be something simple...."
Many people in our audience are affiliated with technology, do you have any comments about technology? "....Technology has changed my life. I always say that it's great to be a blind person in the 21st century because there is so much technology in place. I am able to do virtually everything that everybody else can do even if I have to do it in a different way....I can do anything that anyone else can do and it's pretty awesome...."
Do you have items remaining on your bucket list of goals that you want to achieve and how will you accomplish them? "....I would love to be the host of my own talk show one day so that I can help bring things that I am passionate about to the forefront in a fun and creative way....It doesn't really matter what kind of show it would be, I guess what matters is that it's a topic that I'm passionate about and I'm able to use that passion to entertain...."
Are there some resources that you can share with the audience? "....In terms of whether the audience wants to follow my story and keep up with me: mollyburke.ca, where you will find all the links to social media that I use. I post two YouTube videos a week (basically just educating people on living life as a blind person and my life and how normal a 21 year old I really am)...."
"....There are so many people I look up to and so many people both directly in my life and through the media that I look up to. One person who I've felt really privileged to be able to work with is Demi Lovato....I think it's sad that not everybody knows her story because it's very inspiring. She struggled herself with mental illness and bullying and she now chooses to take that story and be very public about it and help inspire other people like myself with mental health and bullying issues so I find her very inspiring...."
Describe your journey with Me to We? "....For my 18th birthday when I was in Grade 12, I was given tickets to see Craig Kielburger speak because my friends and my family members knew that I really wanted to get involved in going on a service project overseas. I ended up seeing him speak, hearing all about Me to We and Free the Children and I was so inspired like everyone is when they hear Craig Kielburger. I had an opportunity to speak with him a little bit afterwards and ended up chatting about how I had been public speaking for many years and being in Grade 12 I was interested in furthering that but I could not find any university or college or program that I wanted to do because none of them related to my life goals as a public speaker. In our conversation he encouraged me to send in a resume and to reach out, so I did. One thing led to another before I knew it they were telling me that his brother, Mark Kielburger wanted to meet me for coffee. Little did I know it was actually a job interview and on the spot, I was handed the job to be a speaker....."
Earlier you shared some challenges. Do you have any other stories of some “impossible” challenges you were able to master? "....Like I mentioned before my biggest challenge was overcoming the bullying and a lot of people find it very surprising because they think, if anything, my depression was triggered by my vision loss....It was losing the support of my peers that caused my depression to spiral out of control and to bring me down such a dark path and one day it led me to end up being left in a forest at lunchtime when my Grade 8 classmates took my backpack and these crutches that I was on at the time and went back to class without me. I couldn't walk because I had injured my ankle (being new to blindness), I couldn't see and they had my backpack and my crutches and I was supposed to be in class. That was probably my rock bottom. That was just that moment when I was like, 'What am I supposed to do?'...." Can you share some lessons from your experiences and from your other roles worldwide? "....One thing I've learned over the years is in those moments of difficulty and of challenge you sit there and ask: 'Why me?' and you ask that over and over again. I've finally gotten to the point of knowing why and it's because this who I am supposed to be. Every challenge that I have faced in my life has helped me to become the person I am. I am happy now and I love myself and I'm confident and I honestly wouldn't change a thing about my past because we are each meant to go on a journey...."
You have many interests. Can you talk further about them? "....Writing music, recording music, singing and performing in that manner is something that has been really important to me in my recovery and I am a huge advocate of having an outlet....For me in my depression, my release became my journaling and writing and making music so that's a huge passion for me. I'm very passionate about music that has a meaning. I love artists and I listen to songs with stories and messages behind them...."
From your extensive speaking, travels, and work, are there any other stories you can share (amusing, surprising, unexpected or amazing)? "....It was the end of my speech and my Q & A period and I always have somebody help me pick hands because I can't see them myself and this little girl's hand was picked. She stood up and she looked around to everyone and she looked up to me and really quietly she asked me, 'Are you happy now?' and I knew in that moment she wasn't asking me that she wanted to share that I'm happy and I'm okay she was asking because she wanted someone to tell her that she would be okay and that she would feel happy one day. I realized after she asked that question that I don't share my story just to share my story, I share my story to be a voice for the people who can't share theirs. I share my story to be the voice for the victims of suicide and mental health issues who have lost their voice, for the victims of bullying whose voices have been stolen – that's why I share my story. And I share it for her (for that little girl), that yes, she will be okay and she will be happy...."
"....I would say that one of the top issues that I notice, given the field I'm in, is how disability and mental illness seem to be the elephant in the room that nobody wants to touch....I think that is a big issue because that is why there is so much stigma surrounding disability and the invisible disability that is something like mental illness. Because nobody is talking about it, that perpetuates the idea that we are not okay, that we are not normal and that is the thing we need to change about this society. Being okay about talking about it because mental illness is a very common issue and disability is something that exists in our society...."
If you were conducting this interview, what question would you ask, and then what would be your answer? "....One of the questions that I get the most from my audiences is, if I could get my sight back again one day, would I?....Despite knowing how grateful I would be I wouldn't take it because I know this is the person I was meant to be and I'm happy this way. I can live a successful happy life and I don't think I need to be fixed because I'm not broken...."
Molly, with your demanding schedule, we are indeed fortunate to have you come in to do this interview. Thank you for sharing your substantial wisdom with our audience.